Hi Dolls! Sorry for the delay, as we meant to post this last Friday! Continuing on with a post from Tina Duggal, here's everything you need to know about the actual Indian wedding ceremony and reception! The shaadi (wedding) day is the main ceremony. The Hindu ceremony can last anywhere from 2 hours to 8 hours, depending on the region in India the families are from, and even what caste they are. There can be one singular priest or a priest from both the bride and groom's side who conduct the ceremony. There is a fire in the middle of the 'mandap' (the area where the marriage ritual is performed) which symbolizes the presence of Agni Devta (the Lord of Fire). The priest(s) chant Vedic verses in Sanskrit, and the bride and groom (who are either sitting side-by-side or directly across from each other) perform several rituals, including pouring rice into the fire and tying sacred threads around each other. The final ritual of the ceremony is called the Mangal Pheras, the steps around the holy fire. The bride's father ties a pink piece of cloth to the bride and groom's clothing, binding them together. The first four pheras are led by the groom, and each circle around the fire has its own significance. The last three pheras are led by the bride. Once completed, the groom ties the mangal sutra (the wedding necklace) around the bride's neck. This is similar to a wedding band, and it is believed to protect the lives and union of the bride and groom. The groom also places sindoor (red powder) into the hair part of the bride, symbolizing her status as a married woman. Then the bride and groom seek blessings from the gods, from their parents, and from the priest. After the ceremony is the reception! Indian wedding receptions tend to be more modern and reflect western weddings. Many couples opt to make a grand entrance, have a bridal party, dance to their wedding song, cut the wedding cake, and partake in other western wedding traditions. The difference is the decor, the food, the music and some of the traditions. The bride and groom tend to sit on a stage so that all the guests can see them and take photographs with them. The food is almost always done buffet style. One tradition unique to Indian weddings is the have the "Joota Chupai" (which literally means "Hide the Shoes"), where the brides' side will try to steal the groom's shoes in exchange for money. 1. Indian Wedding Site | 2. Examiner | 3. Wedding Paper Divas | 3. Textile Guides | 4. Dil Shil | 5. Wide range of Bridal Dresses from multiple suppliers; choose best supplier with best prices and excellent services. All Bridal Dresses suppliers are verified by AdClout which ensures best quality products. 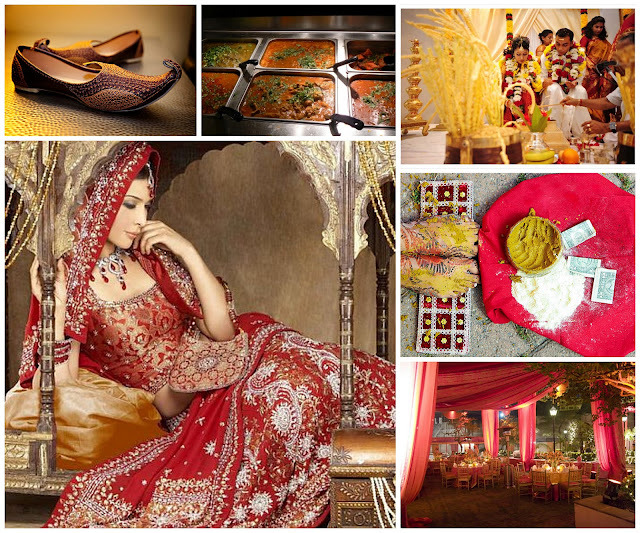 The information about indian wedding and the images provided in this blog was really excellent. Thanks for sharing. It was an amazing experience to visit this website and read the articles and contents. I agree with you. Thank you for sharing the update. It is interesting to have it discussed widely, so that we can gain more objective opinions.